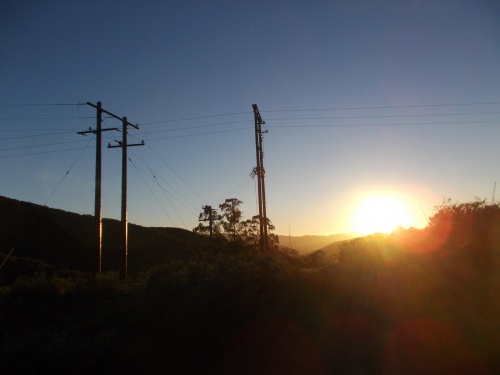 December 21: It was 2:30 in the morning, and I stood outside of my mom's house in San Luis Obispo. The air was chilly and a few streets lights struggled to keep the darkness away. The stars shined brightly overhead. A few minutes later, at the end of the street I saw headlights turn the corner and grow brighter as they approached then slowed to a stop in front of me. It was my sister, Courtney. 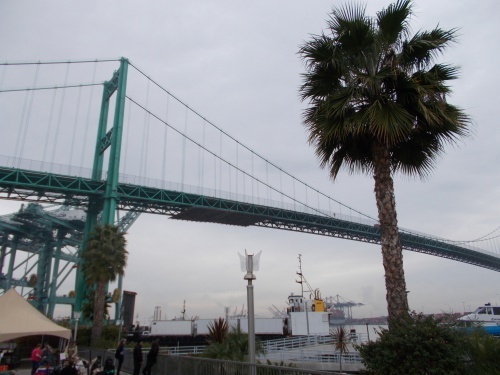 This bridge towered over the ferry terminal. "You have to drive," she told me. "I didn't get any sleep last night and I almost fell asleep the last ten minutes getting here." "Not a problem," I told her. I wasn't surprised to learn that she hadn't gotten any sleep the night before. It was less than 10 hours earlier we had met for a mini-family reunion in Santa Maria to the south. 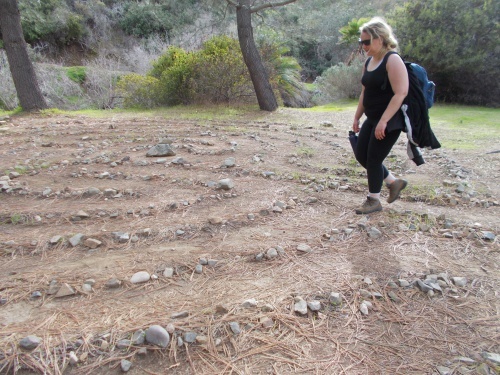 Courtney had just learned that I made plans to thru-hike the Trans-Catalina Trail and wistfully said how jealous she was. I told her that she was welcome to join me. I fully meant it, although I doubted she'd join me at such short notice. Her face lit up at the prospect. "Really?" And it was done. 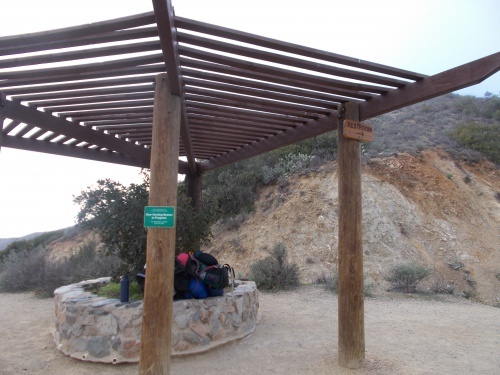 We looked up the phone number for Catalina Express to reserve a seat on the boat to and from Catalina Island for her, then called the visitor center on the island to add Courtney to my camping permits. Courtney would have to do a few other tasks before she could go. Grocery shopping, pulling together a sleeping bag, backpack and other necessary camping gear--not to mention cancel any other previous plans she had made for the next few days. But for now, we had a family reunion to attend! We drove south to Santa Maria discussing the logistics of the trail. The family reunion was fun, and we spent a few hours chatting and catching up with family that I hadn't seen in years! It was a great visit, but we had to get going. Courtney still needed to pack for her upcoming backpacking trip. I still needed to do some packing as well, but at least I already had my gear gathered together and completed all of the grocery shopping needed. I was mostly ready. Courtney lives in Paso Robles, about a half-hour north of San Luis, so she dropped me off at my mom's house with the promise to pick me up at 2:30 in the morning--early enough to catch the first boat to Catalina from San Pedro. We weren't sure how traffic would be. It could get bad in places near Los Angeles, but it was also the Friday before Christmas. Would traffic be light because everyone took the day off from work? Or would they cause an even more epic traffic jam driving to far-flung locations like we were? Traffic, we knew, at 2:30 in the morning wouldn't be heavy, but it could be by the time we passed through Thousand Oaks and--heaven forbid--along the 405. So we left with extra time to spare. If we arrived early, we could stop somewhere near the ferry terminal for breakfast. 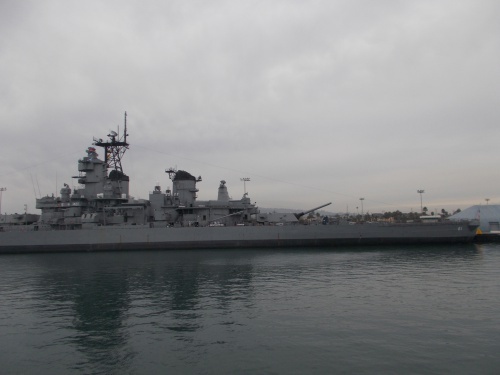 This is the Battleship USS Iowa, on the Los Angeles waterfront. Wish we time to visit it! So when she pulled up at 2:30 in the morning saying that she had gotten absolutely no sleep and I had to drive, I wasn't surprised. She only had about 4 hours at home to get packed and all her affairs in order before picking me up. For my part, I was a little sleep-deprived myself, but at least I got a solid 3 or 4 hours of sleep. I might feel like crap later in the day, but for now I was wide awake. Courtney got into the passenger seat while I took the wheel and headed south on the 101. Courtney fell almost immediately to sleep, and I drove the now-quite highway contemplating the meaning of life. I thought about turning on a radio as a diversion but decided against it to let Courtney sleep. A half hour later, we passed through Santa Maria--where we had been just the evening before. It's a shame we hadn't planned things out earlier. 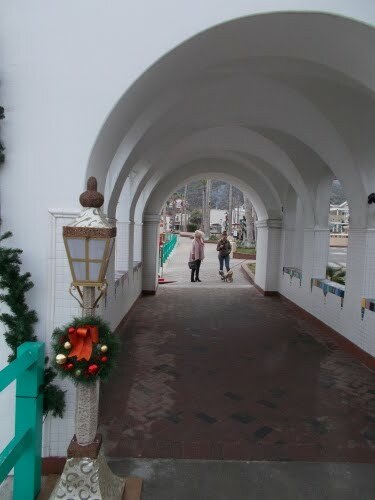 We could have spent the night in Santa Maria after our mini-family reunion and saved ourselves the effort of driving back north just to come south again. We could have slept for an extra hour or two with more advance planning. Too late to do anything about that now, though. 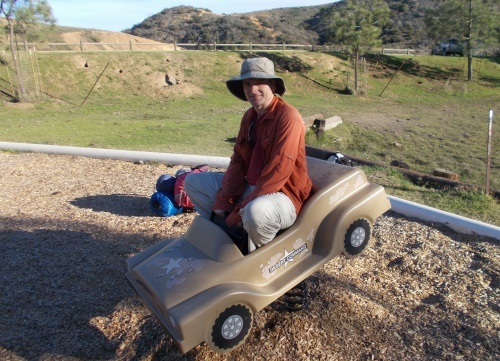 We stopped briefly in Camarillo to get gas. Our dad lives in Camarillo, but we didn't have time to stop for a visit. We had a boat to catch! We planned to visit him on our way back, though, when time was less of an issue. Courtney woke up while we were getting gas, but quickly fell back asleep once we were on the road again. Traffic grew definitely heavier after we passed Camarillo, but it still flowed well. When we exited the 101 to the 405 and over the grade by the Getty Center, I had to slow down to about 30 mph due to the traffic. I'd call it "heavy traffic," except this was probably the fastest I've ever been able to drive along the 405. Things were moving really well! The slow-down lasted about 10 minutes before I could speed up to normal highway speeds again. We drove past the exit for LAX, which largely marked the end of the "known road" for me. I've been south of LAX before, but not very often and I don't really remember much about how things look or how to navigate past that point. Now I had to rely on a GPS for directions--which my phone told me in Polish. I finally exited the 405 to the 110 freeway and the last few miles to San Pedro. I woke up Courtney, telling her that we were a couple of miles away from the ferry terminal. Our driving was basically done, and we had arrived a little over two hours before the boat was scheduled to depart. Perfect. It was time for breakfast. We exited the 110 and found ourselves in an industrial area of town that didn't appear to have much in the way of food, but Courtney searched on her smartphone and located a diner--the Happy Diner, no less!--that was allegedly open and located about a mile away. We headed to it. We ate and chatted, mostly just killing time until our boat was scheduled to leave. 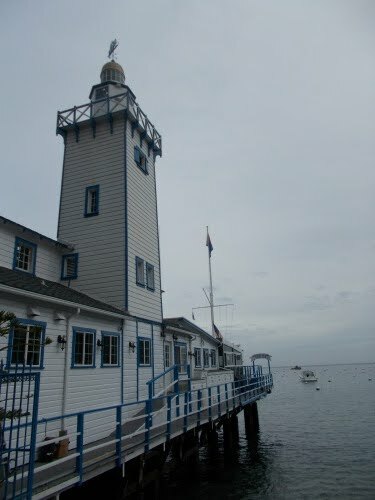 About an hour later, we paid the bill and continued to the Catalina Air and Sea Terminal. 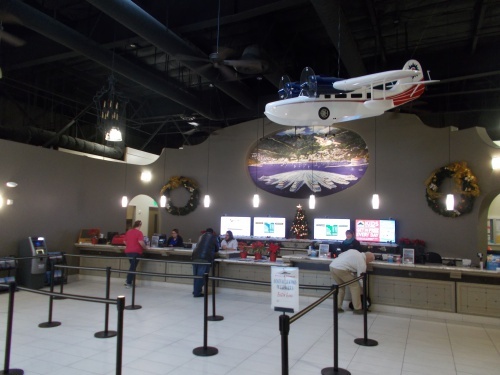 We checked in for our boat tickets at the terminal here. It was starting to get light outside now. The sun had probably risen, but we couldn't see it through the thick clouds that covered the sky. 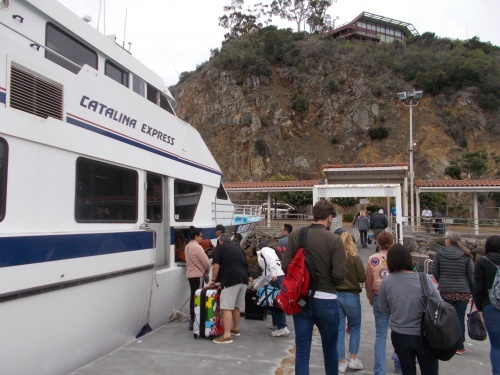 We parked, got our boat tickets and after a short wait, we boarded our ship to Catalina. 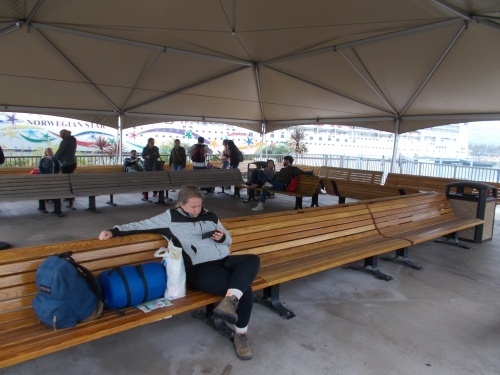 Courtney waits for our boat to board by playing on her smartphone. I headed to the upper deck--I wanted to be as high as possible for the best possible views--but mostly stayed inside where it was warmer rather than the outside deck. I could still admire the views through the windows. Courtney, within minutes, reported feeling seasick and left to go downstairs. Later, when I stopped to check up on her, she showed me a line of vomit on the side of the ship where she threw up her breakfast. "Nice," I told her, backing away from the side of the ship. 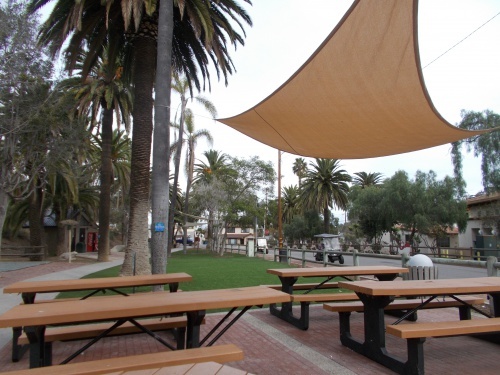 Catalina, or--more properly--Santa Catalina Island--is one of eight islands that make up the Channel Islands located about 30 miles off the coast of California. 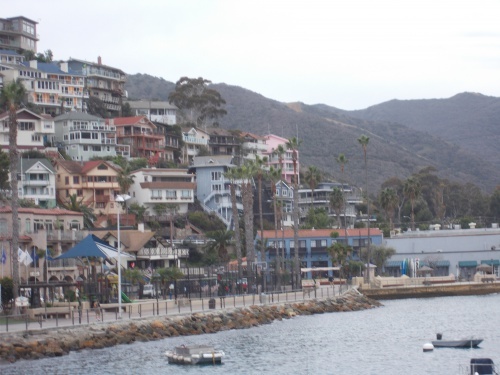 Catalina is, by far, the most developed of the islands, with about 4000 people living on it. Which doesn't sound like much, but the island typically gets over one million tourists each year. It can be busy and crowded place! 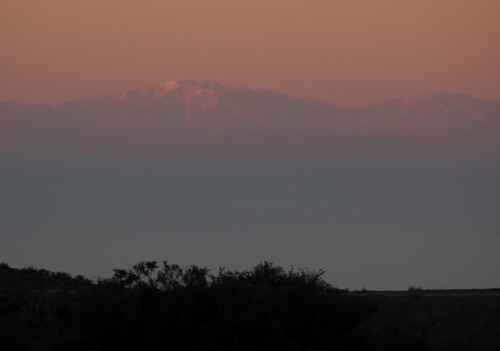 Catalina Island looms ahead... what adventures will await us? The islands have always been separated from the mainland and therefore are home to about 150 unique species endemic just to the islands or, sometimes, a single island. 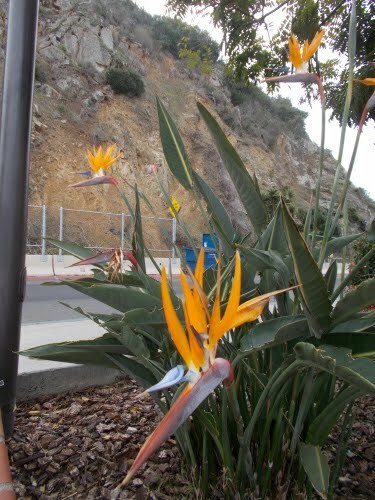 Catalina is home to about 50 species that are endemic to just that one island. 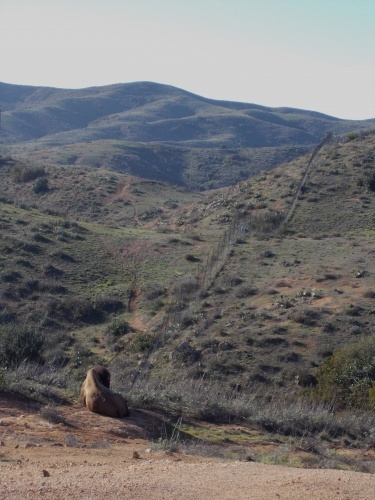 Although it's surrounded by water, the Channel Islands are very dry with little fresh water. 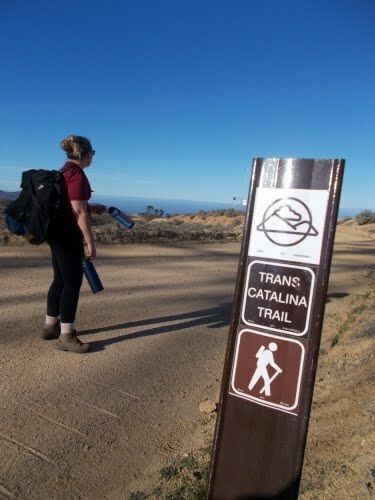 The only official sources of water on the Trans-Catalina Trail are located at campgrounds and other civilization, although there are cow tanks occasionally to be found. Nobody wants to drink from a cow tank, though. 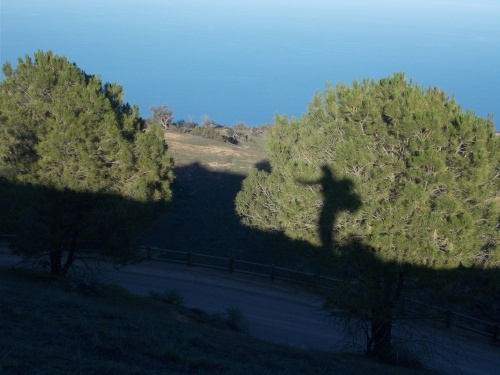 I did that on the Arizona Trail and would prefer not to repeat the experience if I didn't have to. 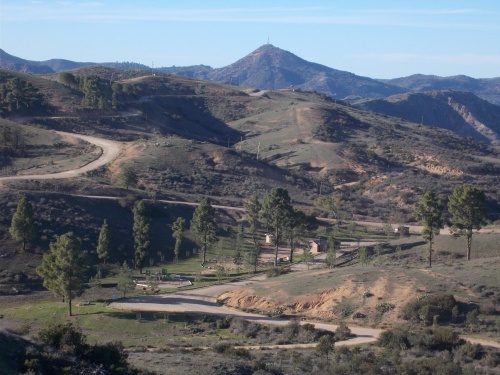 Catalina gets about 10-14 inches of rain each year--not quite "officially" a desert, but pretty close to it. In the summer, temperatures can soar to over 100 degrees, but in December, we expected lows at night near 50°F (10°C) and highs in the mid-60s (18°C). Perfect hiking weather! I had checked the long-term weather forecast before making my reservations to make sure I would avoid rain, so no rain was in the forecast. 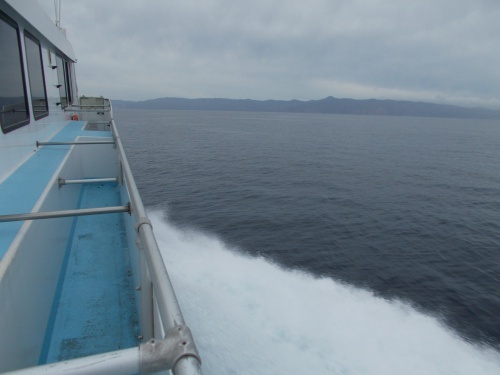 Catalina is perfectly visible from the mainland, so we could see the island almost immediately upon leaving port and watched it grow steadily bigger as we approached. 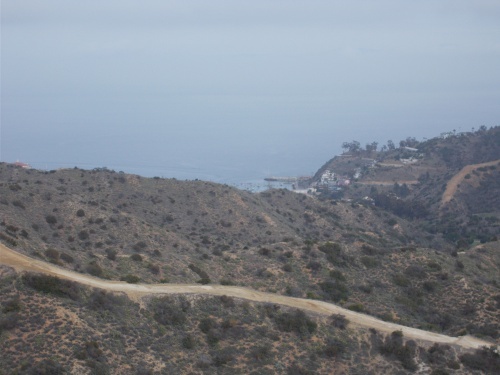 Catalina is 22 mi (35 km) long and 8 mi (13 km) across at its greatest width, but it's a rugged landscape with mountains towering over 2,000 feet (630 m) high. And we would be exploring almost the entire island on our little hike. 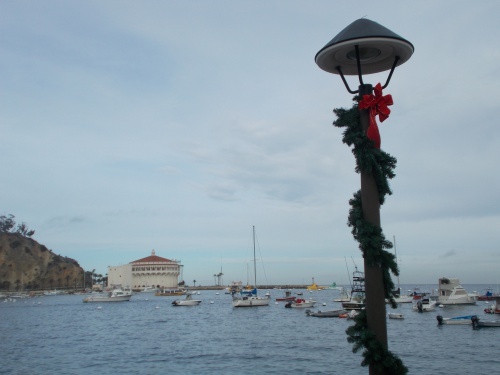 This would be my first visit to Catalina. 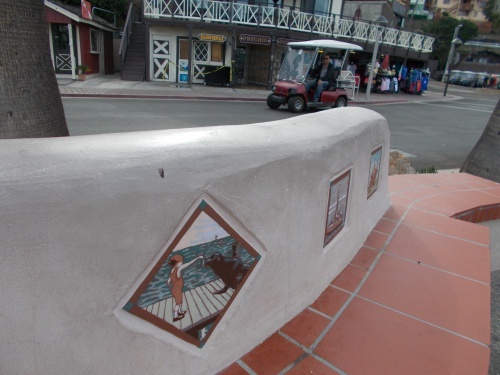 I had been to Santa Rosa Island before--another one of the Channel Islands--but this would be my first to Catalina. I was looking forward to it. 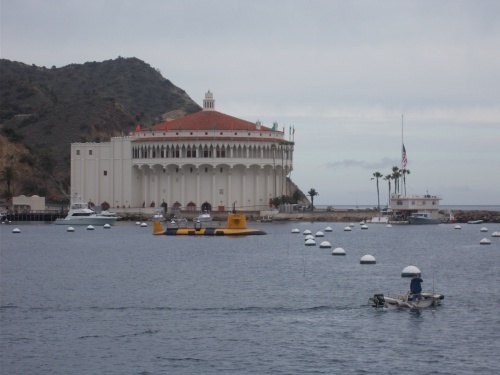 The view of Catalina Casino from the boat as we pulled into Avalon. 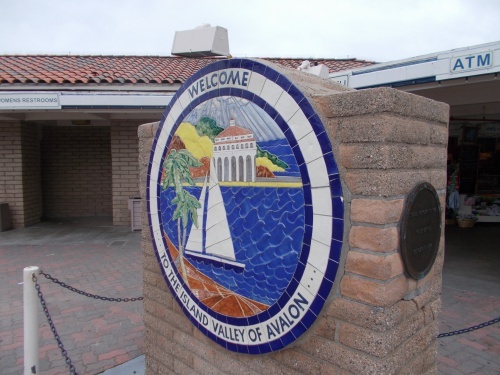 About an hour after we started, our ship docked in Avalon, the only incorporated town on the island. Before we started hiking, we got all our gear in order. I had carried a duffel bag to use for a checked bag, but I needed to put all that in my pack. Courtney, I was surprised to see, showed up with a small day pack and a super-large, living-room quality sleeping bag. She didn't have much in the way of backpacking gear and took what she had available.... which was less than ideal. In the end, there was absolutely no way her sleeping bag would fit in her pack. She knew this might be a problem, however, and brought some twine to tie it to her pack. We tried a couple of ways of tying them together but it wasn't working. At all. The twine kept breaking way too easily. Surely there was somewhere in town we could find something better to attach her sleeping bag to her pack. We found a hardware store where I bought some webbing, but that didn't do much better. The webbing didn't break easily, but the sleeping bag wouldn't stay on the back of her pack--it would continually slide off to the side and leave the pack lopsided. I finally gave up and said screw it! I'll just carry her sleeping bag! My pack was already loaded with way too much stuff including my big, fancy camera and more water than I'd really need, but I could make room for her pack despite its large, bulky size. It was a tight fit, but I got it done. 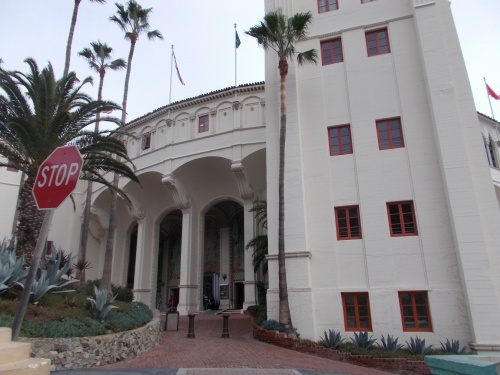 Before leaving the town of Avalon, we walked over to the Catalina Casino, the most impressive structure on the island. Casino is Italian for "gathering place"--it's not an actual casino with gambling. It's a theater which, when we were there, was playing the movie Bumblebee. I'd have loved to take a tour of the place (and they do have them!) or seen a movie, but we really didn't have time. 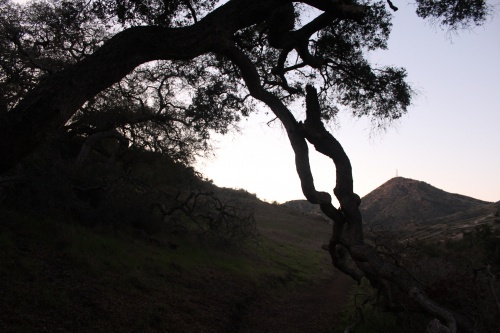 Our first campsite was located about 10 miles down the trail and in December, the sun sets relatively early. 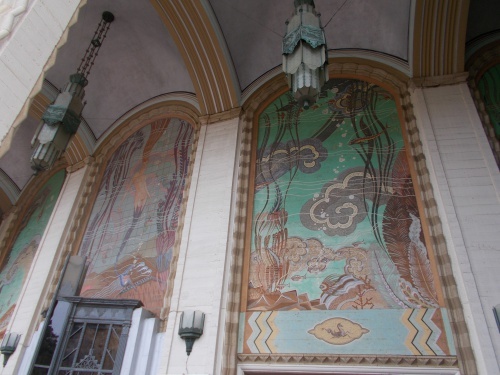 The Catalina Casino is just as impressive close-up as it was from a distance! It's official! 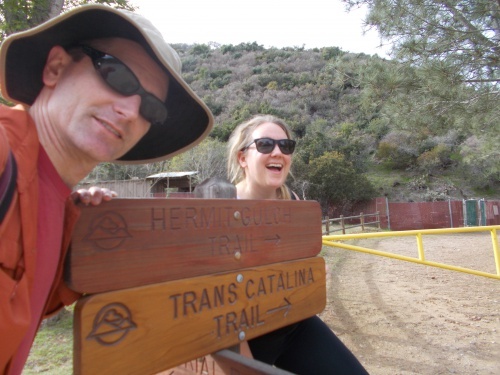 We found our first Trans-Catalina Trail sign! We're on the trail! The first couple of miles were flat, easy and uneventful. Then the trail left town and turned uphill into the wilds. The trail was well-graded with lots of switchbacks, but it was a long slog upwards and Courtney struggled up the steep slope. This trail was already turning into something a lot more difficult than either of us had anticipated. The next mile seemed like it took over an hour to complete, steadily rising higher and higher. 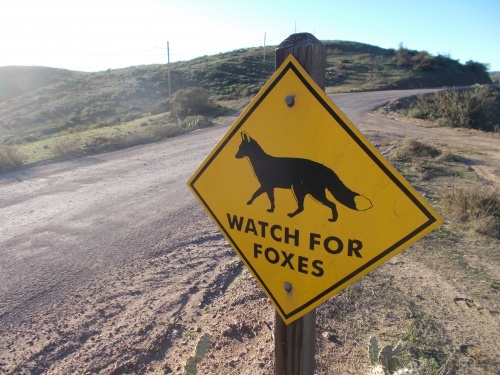 Eventually it popped out on a ridge and followed a dirt road and progress went quicker. 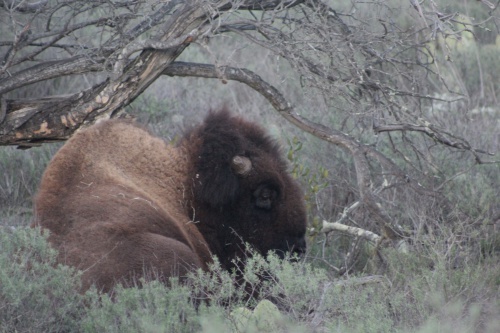 Along the way, we saw a couple of bison near the trail. 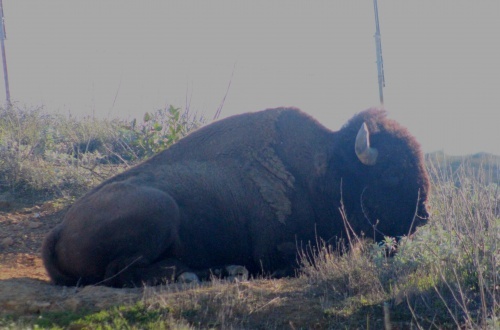 We weren't surprised to see bison--they're a popular tourist attraction and an icon of Catalina. 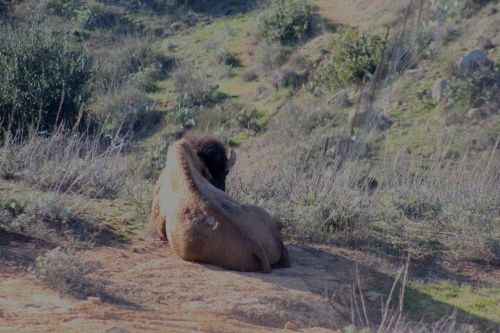 There were 14 of them brought to the island in 1924 to film for a movie and after the movie was done, they decided just to let the animals loose and Catalina has been inhabited with bison ever since. At one point, the herd reached as many as 600 animals, but now they control the population and keep it down to about 150. It was almost guaranteed that we'd see a few of these beasts along the way. 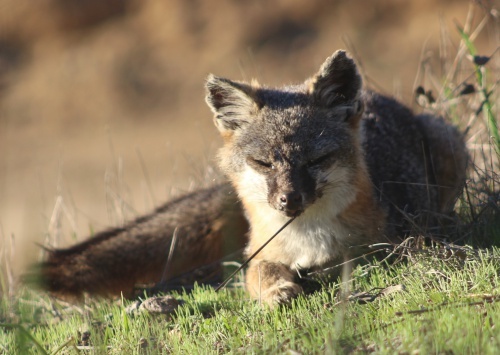 With about 150 animals on such a relatively small island, they couldn't all be hiding! 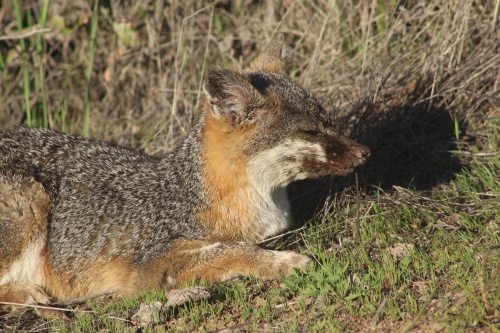 It's the Catalina Island fox! What a beauty! Courtney was growing increasingly more exhausted and slowed down more and more throughout the day. Looking at the time, I started having real concerns that we'd even make it to camp before dark. We needed to make it to camp before dark for two reasons: I was taking photos for Walking 4 Fun and needed the light for photos, but also because it was actually against the rules to hike out here at night. We marched onward and the sun finally set. Darkness was descending rapidly. I put my point-and-shoot camera away and started using my fancy camera for photos. It had a much larger sensor for taking photos and was therefore better suited for low-light conditions, and I kept taking photos, making them look much lighter than they did in real life. 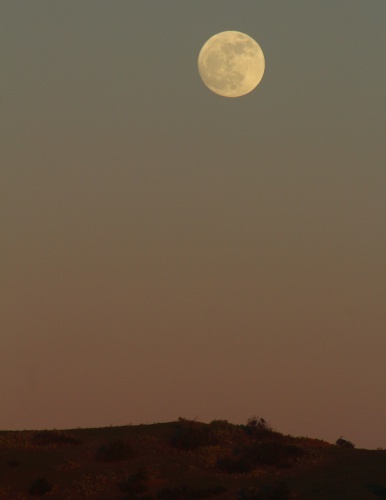 A nearly full moon rose over the horizon. At least we'd have some moonlight to help light the way the last bit of the way to camp. Nearly an hour after sunset, it was dark. Completely and totally dark--except for the moonlight, of course. I couldn't even fake daylight photos with my camera anymore. I still took some photos--the headlamps in the dark kind of photos--but I could only get photos of stuff that was close. No more wide views over the open ocean. 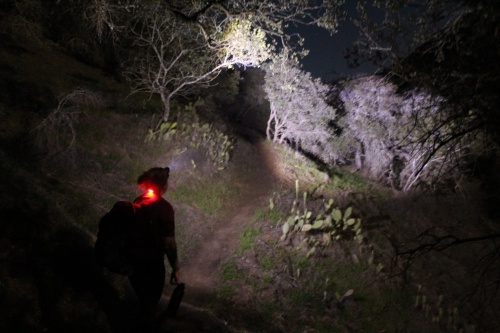 We stumbled through the darkness for maybe a half hour before reaching the Black Jack campground. 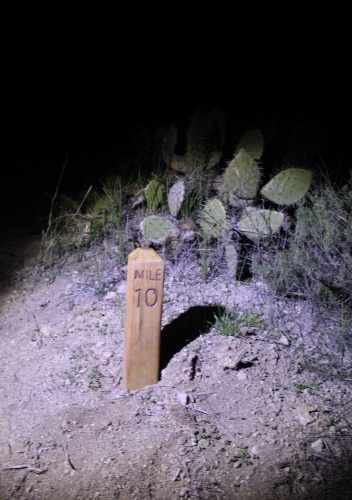 We were assigned to campsite #10, but we had trouble seeing the numbers for the camps in the dark and asked other campers what site they were in and what direction that camp #10 was located. I was ready just to take any empty campsite. The camp had appeared half empty when I made reservations a few days earlier, so I knew there were a lot of empty sites. We set up camp, ate some snacks and soon went to sleep. Courtney was grateful that I had carried her sleeping bag the whole way. "I'd never have made it here with that extra weight," she told me. It was probably just as well that I carried it. It slowed me down! Despite it slowing me down, though, I was still hiking faster than Courtney. She might have exaggerated about not making it to the campsite if she had to carry the sleeping bag, but we certainly would have arrived a lot later than we did. But in any case, our first day was officially done! Hiking at night is against the rules here, but we were forced into it, unable to make it to camp before sunset. View of Avalon from our boat. 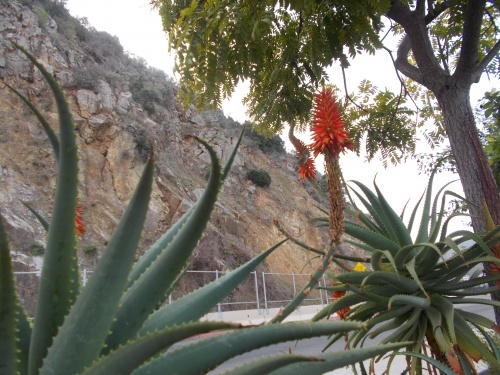 Although not officially a desert, Catalina is pretty close to it and you'll find plenty of cactus in the dry environment. 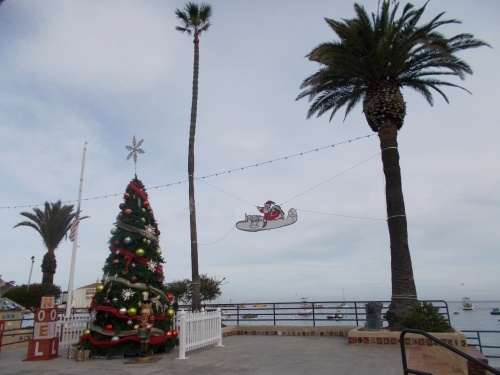 We arrived on Catalina on December 21st, so Christmas decorations were in full view. I think golf carts outnumbered vehicles in Avalon. On an island this small, golf carts rule the road. Looking back down toward Avalon. The trail wastes no time going uphill! 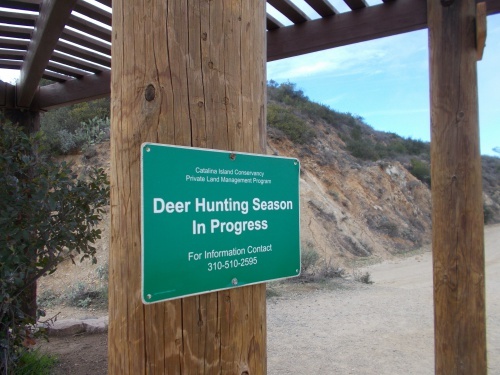 Deer hunting season? Well.... 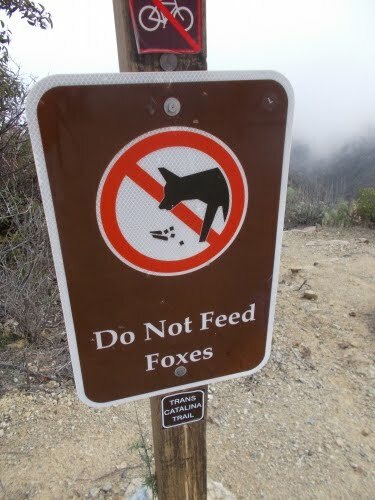 I didn't know about that until I saw this sign. They built this fence to keep out the bison, but it apparently didn't work. Hmm.... That sounds like a metaphor.... for... something....? This is a day-use area which includes... a playground! So we had to stop for a rest. And... playing! 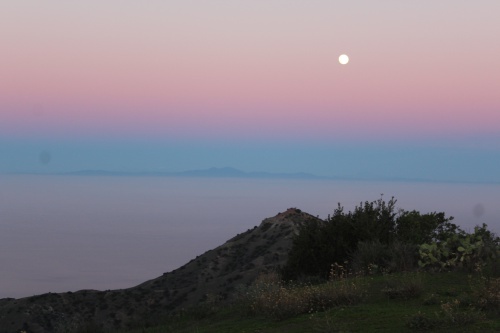 Moonrise over the mainland in the distance. It was actually quite dark when I took this photo. My fancy camera does amazing in low-light conditions! It looks much brighter and lighter in this photo than it did in real life. 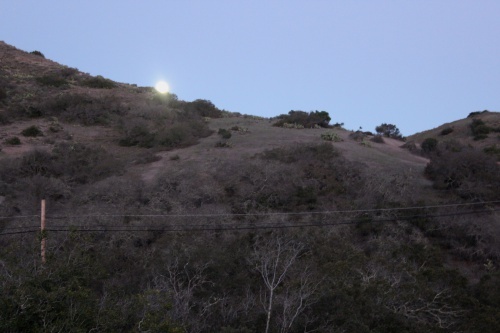 That bright light rising behind the mountain... it's the moon. A heavily overexposed moon. Casino literally means little house, casa being house in Italian. However, in Italian slang, casino means house of ill-repute or whorehouse. It also depends how you pronounce it, pronounced with the accent on the first syllable, means a gambling place, on the 2nd syllable, it is the little house meaning.